15-17 Oct 2015. Looking over the heads of the two men crouching in the stern of the boat I can see she is fully submersed in the roiling waters, and in trouble. 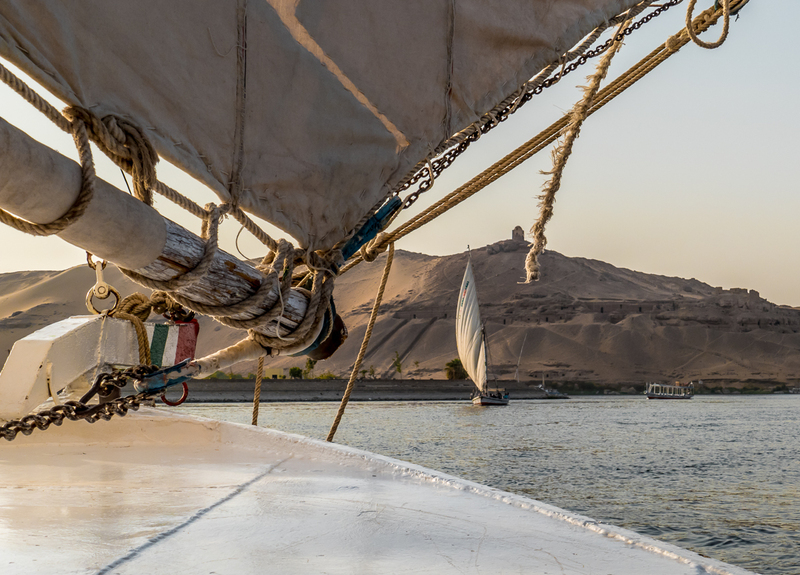 The felucca is racing upstream under a strong wind, but the current is so powerful that the moment she had hit the water it had engulfed her, and the rope, which our guide had insisted upon, is pulled taut. The rope, attaching her wrist to the boat is her lifeline, but it is not enough. She has no control and the relentless current of the river is pulling her under. The rope is part of what saves her life. The other part is that two of the strongest guys in our group are able to lean over and grab an arm each. They try to haul her up, but she’s too heavy. They hold on for a few interminable seconds as she flails around in the water. Then relief comes. She’s able to find a foothold on the side of the boat and with that extra leverage the guys are able to haul her in. Phew. 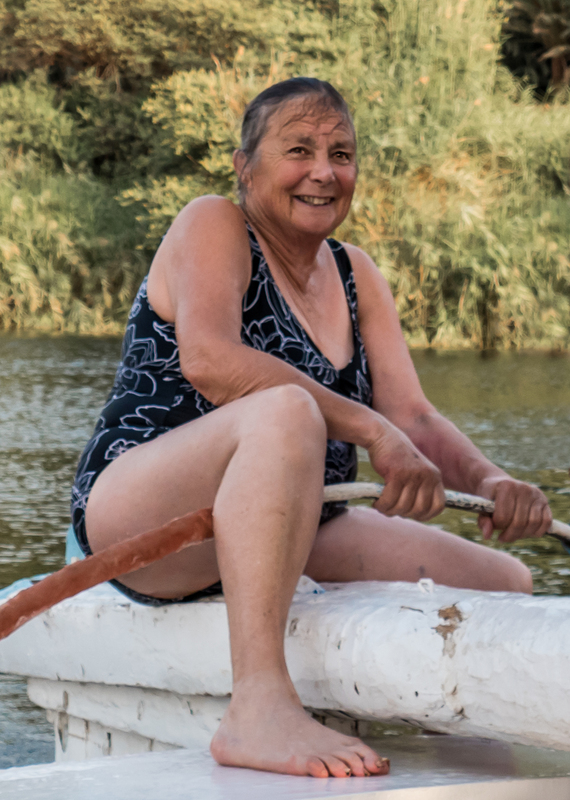 She coughs and splutters for a few minutes and then, despite that she nearly drowned, despite the rope burns on her wrist, a huge smile lights up her face. She did it! She swam in the Nile! No matter that she’s a little out of shape. No matter that she’s in her seventies. It had been a lifelong dream to swim in the Nile and she did it! What a woman. Brave, foolhardy, determined, and perhaps a little crazy, I think it is an experience she will never forget. I probably won’t forget it either. Feluccas are the graceful wooden sailboats that have sailed the Nile since the days of the pharaohs. For thousands of years they were the primary means of transportation on the river. Few these days are completely wooden, but they are still propelled by their distinctive triangular lateen sail made from cotton or other natural fibres. Winds blow upstream during the day allowing travel in that direction. The strong current of the river takes them back downstream. I first heard of travelling the Nile in a felucca sometime in my twenties. In those days I thought of living on one for a couple of weeks, but I never managed to make the dream a reality. Finally here I am. It is for two hours rather than two weeks, but I am content. I am am sailing into the sunset on a felucca on the Nile and I feel as if I’ve come home. It is the realization of a dream nearly forty years old, and I dissolve with quiet joy into the serene reality. 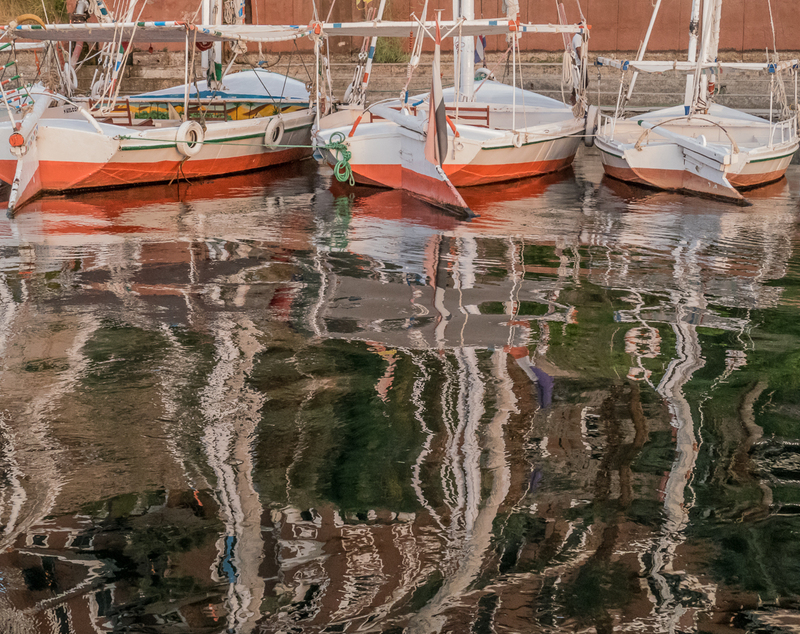 There is an easy graceful four-part dance that happens between the captain, the boat, the wind, and the water: a transcendent intermingling as if all four are one body. 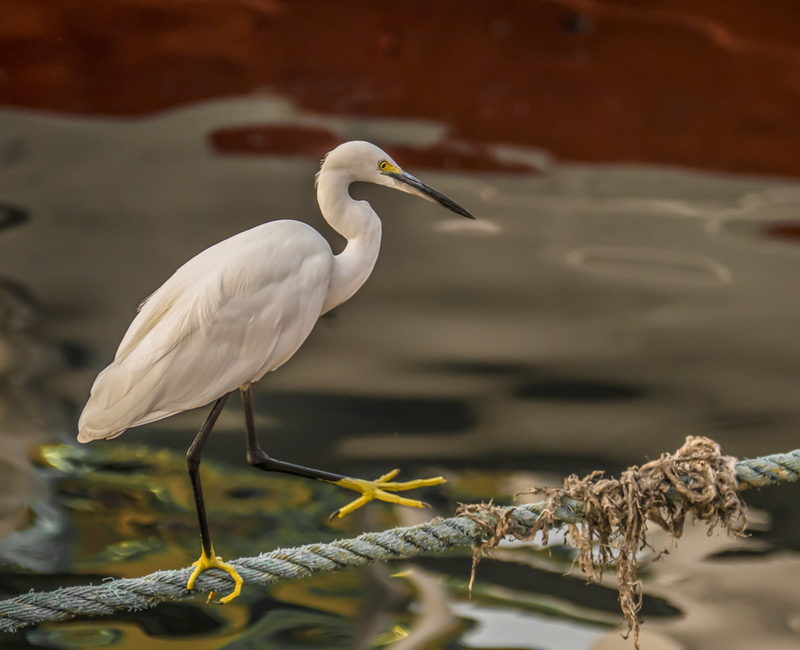 The captain so fully reads and understands the water and the wind that he can manoeuver his craft with the same elegant refinement as a bird in flight. The singing boys on the other hand have a far more prosaic way of travelling, though they too know the river well. Very well. We see them first in the distance: two lads somehow paddling upstream on an old surfboard. Without paddles. The best I can discern is that they have a small piece of wood, and their bare hands. And the strength of youth. They pull up to the side of our boat and cling on. And then they start singing. For several minutes, with great enthusiasm, they serenade us with old familiar western songs: Yankee Doodle Dandy, Row Row Row Your Boat, and others that we are all familiar with. The smiles, the hilarity, the joy, the sheer brazen confidence of them! We are captivated. This simple kind openhearted human connection charms us all. Then they ask for money. Which we gladly give them. How could we not? Their ingenuity alone merited it. We are sailing to the legendary Old Cataract Hotel. The Old Cataract, built in 1899 during the British colonial era, is a luxury resort hotel on the banks of the Nile at the south end of Aswan. It is a world unto itself. Winston Churchill, Margaret Thatcher, Jimmy Carter, Princess Diana, Tsar Nicholas II, and Queen Noor have all stayed at the Old Cataract. Agatha Christie also stayed there, and she used it as the setting for parts of her novel Death on the Nile. It was also the setting for the 1978 film of the same name. We sail there for sunset, and drinks on the terrace. 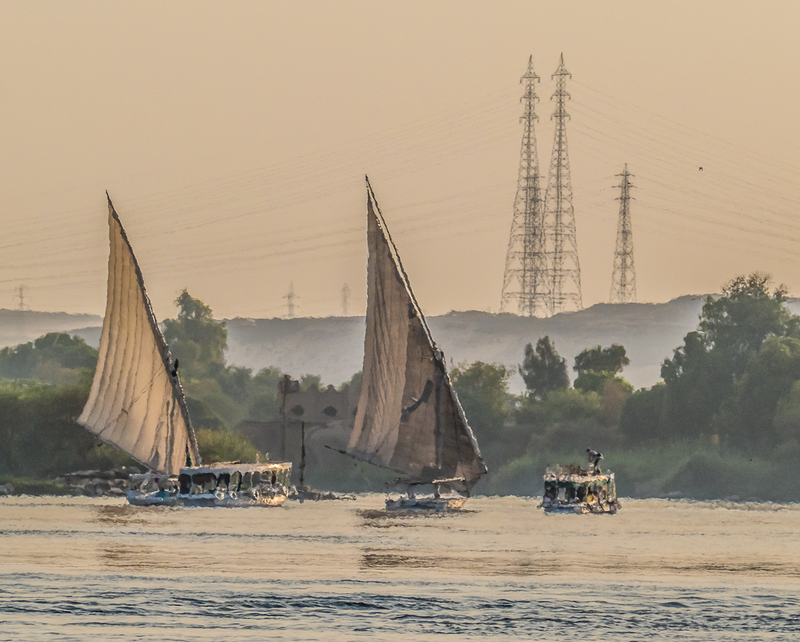 Traditionally the Nile was thought to be the longest river in the world though scientists now debate whether the Nile or the Amazon wins the prize. Either way, the Nile flows north from somewhere in the highlands of Burundi or Rwanda in the Great Lakes region of Central Africa for a mind-boggling 6,853 kilometres (4,258 miles) to the Mediterranean Sea. The Nile is almost twice as long as the United States is wide. It flows through eleven countries and is the principal water source for Egypt and Sudan. Most of Egypt’s cities are in the Nile Valley, and nearly all the historical landmarks of antiquity are found along the banks of the river. 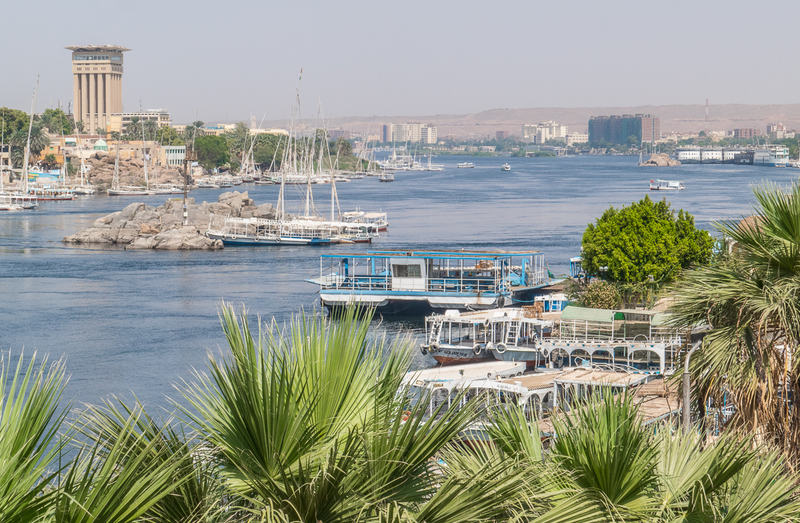 The Greek historian Herodotus declared that “Egypt was the gift of the Nile” and indeed nothing that we know Egypt to be, both now and back into the distant past, would have arisen without this boundless source of water. The land was fertile because the river overflowed its banks annually and deposited silt. This allowed the cultivation of crops from ancient times. 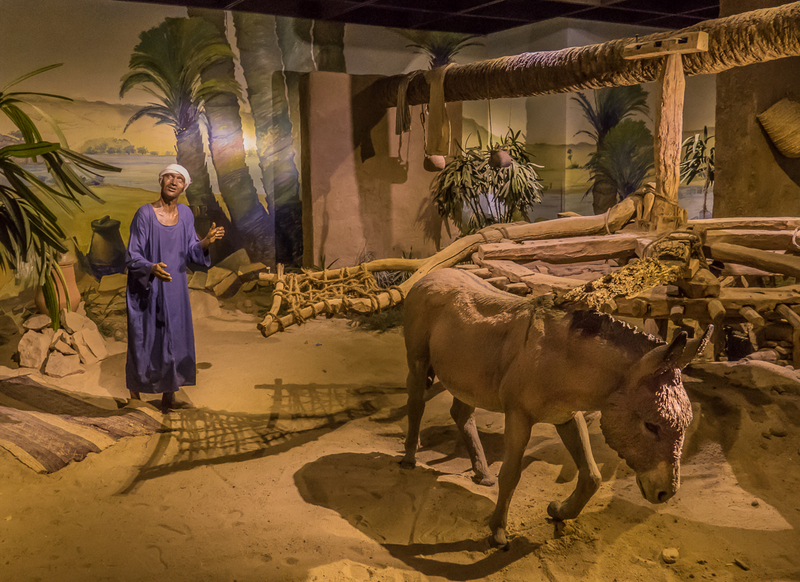 Probably the first people to develop agriculture and use the plow were living on the banks of the Nile. Through trading food surpluses Egypt knew economic stability and became a great power. To the Egyptians of antiquity the river was sacred. They believed that it came from the stars. Until 1970 the Nile flooded every year. Some years the flooding was so high it would wipe out the crops. Other years the water would be so low that it would result in famine. 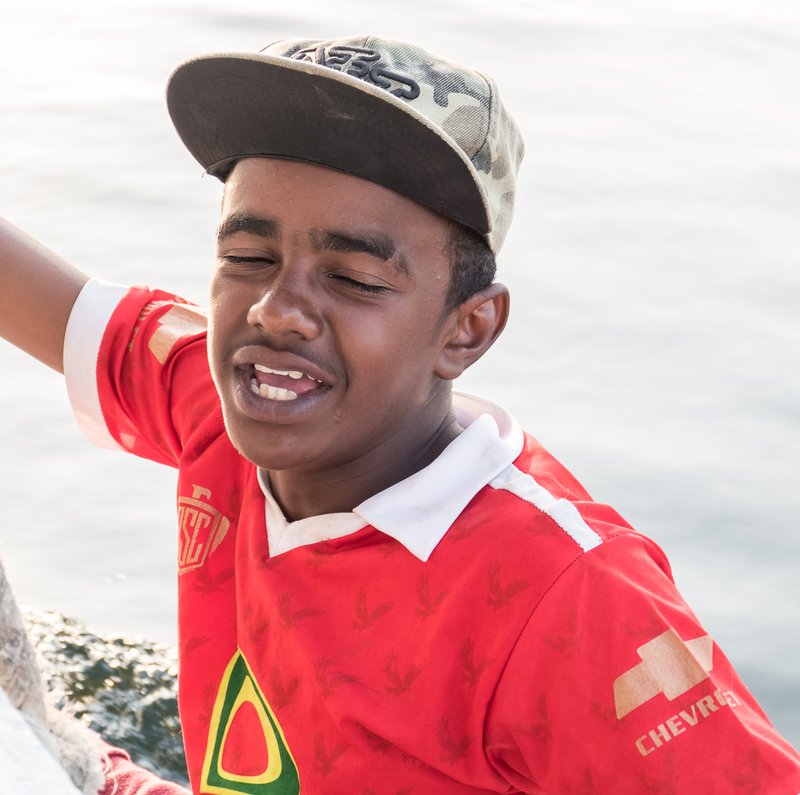 The Aswan High Dam was built to control the flooding, but it is a double-edged sword. The dam means that the summer floods no longer annually deposit rich fertile silt on the banks, which has led to dramatic changes in farming practices, including the overuse of chemical fertilizers. Rice, wheat and maize are major crops. Cotton has traditionally been important. Other important crops are oranges, tomatoes, potatoes, and sugar cane. 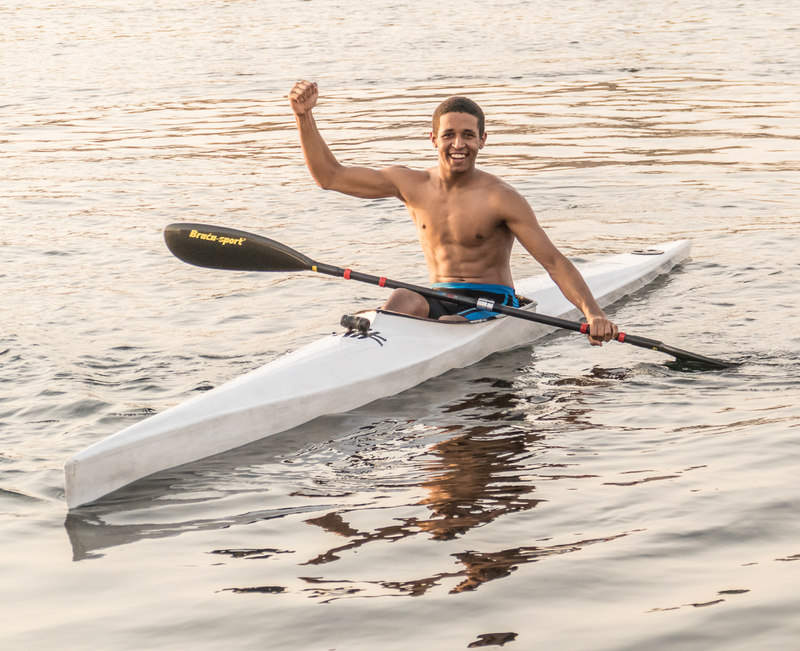 All of it is possible because of the river. Without it there would be no farming. The river cuts like a dream through the hot harsh desert. and hundreds of motorized tour boats. What is it about water? We search for it in space as an indication of life on other planets, for we know both scientifically and intuitively that there is no life without it. We fight for ownership of it. We fight to live near it: any home with a water view is automatically worth more than one without. We know right to the liquid-cell core of our beings that the water that flows within us is that same water that flows in the brook, the river, the lake, the sea. This liquid luminance runs so strong in our collective psyche that the simple view of it is enough to calm the most beleaguered soul. Water reminds us that we are liquid, and that we can flow, that when we are calm we are brilliantly reflective, and that we will always, eventually, find our own level. 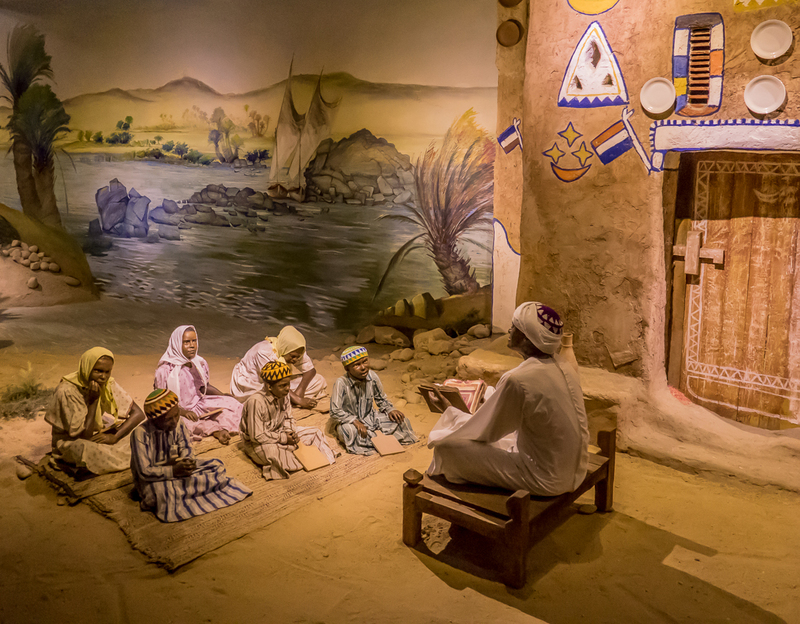 We go to the Nubian Museum in Aswan. 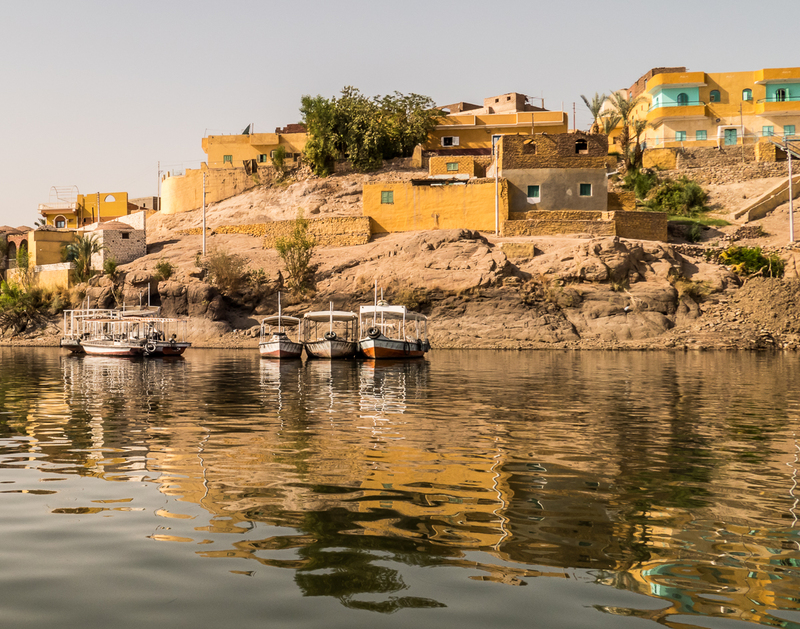 Nubia is that vast area of land surrounding the Nile from Aswan in the north to Khartoum, about 1400 kilometres (870 miles) to the south in Sudan. It is harsh desert country with little rainfall and without the soft riverbanks further north that allowed the development of agriculture. Nubians are believed to have been the first human race on Earth and the ancient Egyptians adopted many of their customs and traditions. 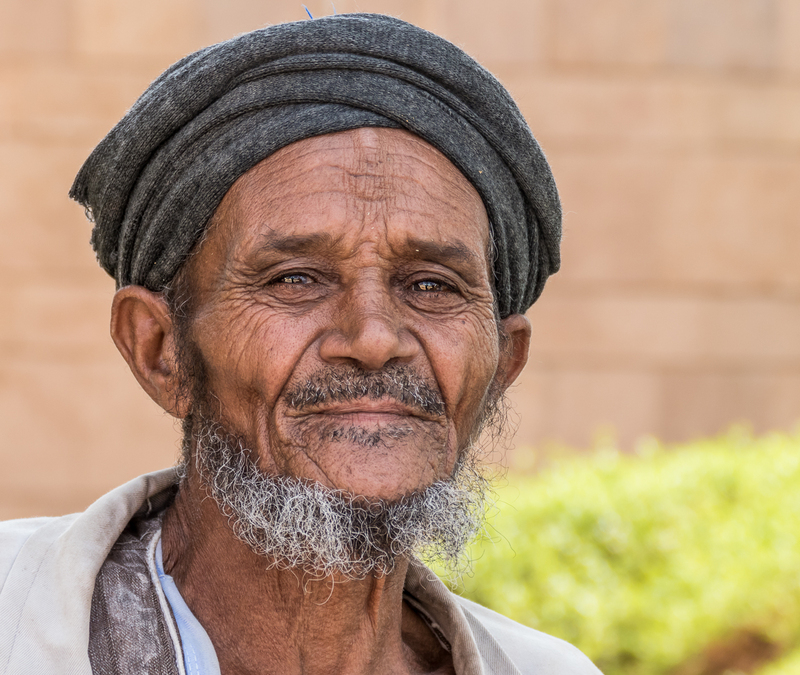 The ancient Greeks referred to them as Ethiopians. In antiquity Nubia was largely dominated by Egypt, but when Egypt couldn’t maintain power in Nubia due to its own internal troubles various Nubian cultures flourished. To the ancient Mediterranean world Nubia was a mysterious and exotic land from which came great wealth: gold, ebony, ivory, incense, and exotic animals. It was a major trade route from sub-Saharan Africa north to the rest of the world. Egypt conquered Nubian territory, and Nubia in turn conquered Egypt. Known as the “Black Pharaohs,” Nubian kings ruled Egypt from roughly 760 BCE to 660 BCE. Over time the Nubian culture was assimilated into the Egyptian. 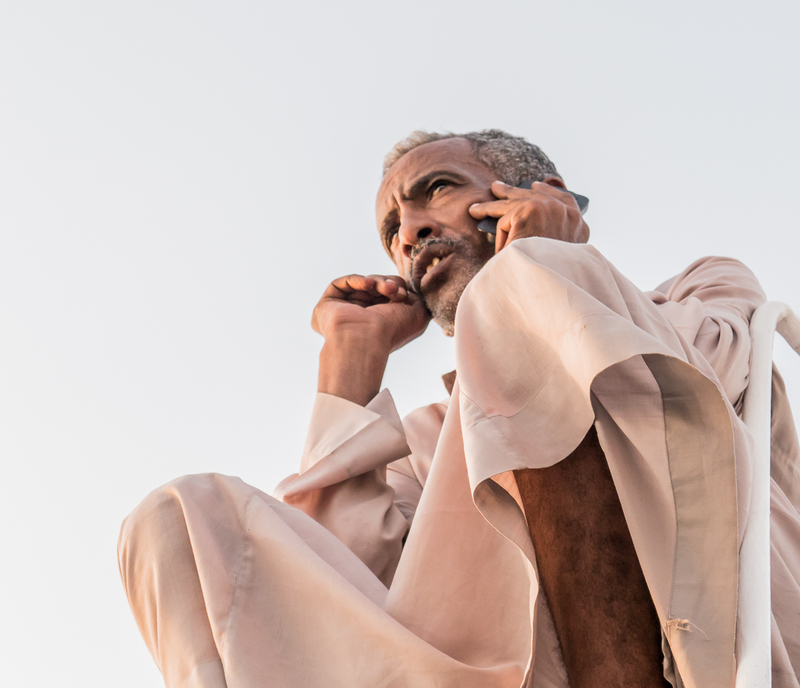 Today the inhabitants of southern Egypt and Sudan still refer to themselves as Nubian, and still speak the Nubian language as well as Arabic. 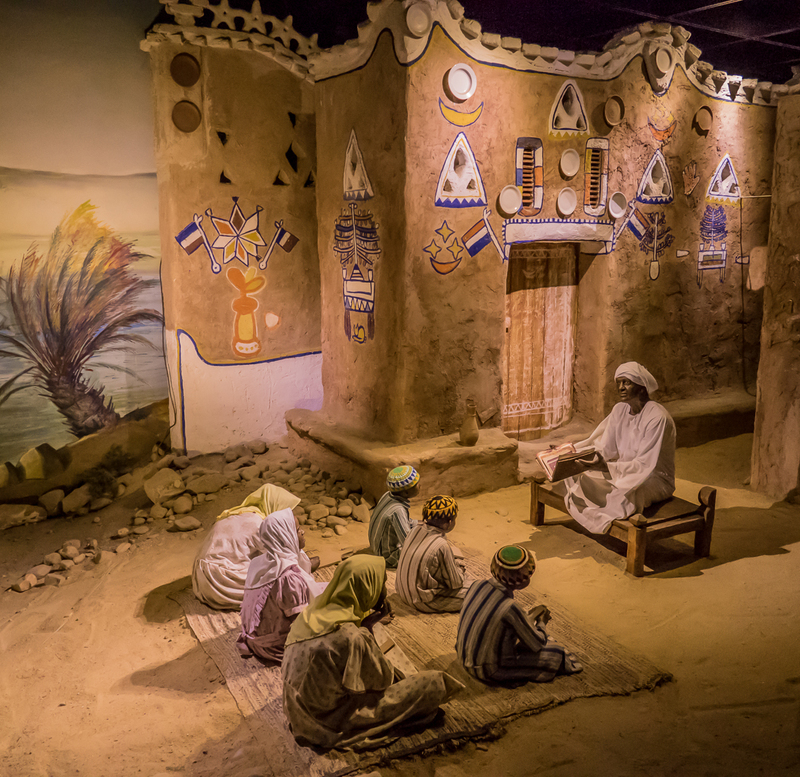 The museum building is based on Nubian architecture. 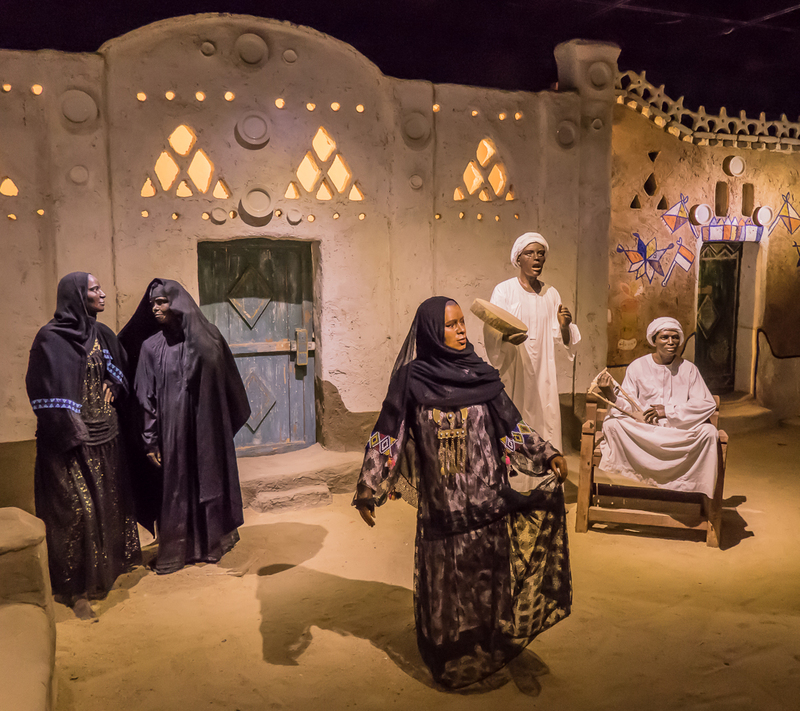 As well as 5000 artifacts, there are many fine dioramas of ancient Nubia that bring to life the culture of these people of the desert. In the terraced garden, complete with boulders and a tiered watercourse evoking the ancient landscape of Nubia we meet the serene gardener. 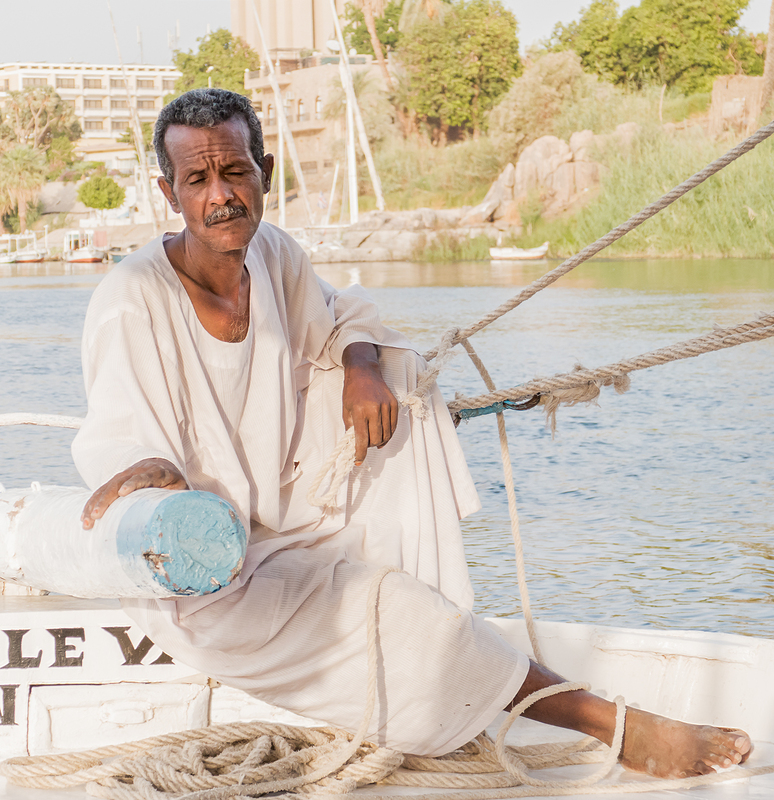 Later we are taken by boat to a Nubian village upriver from Aswan. We walk in the dusk over a rough dirt track past half finished brick buildings. We come to the top of a small hill just before sunset and look out over the village on a backwater of the river. We are taken inside a brick house similar to the others we’ve seen and up the stairs onto the roof. Rugs and cushions are spread out on the concrete floor. 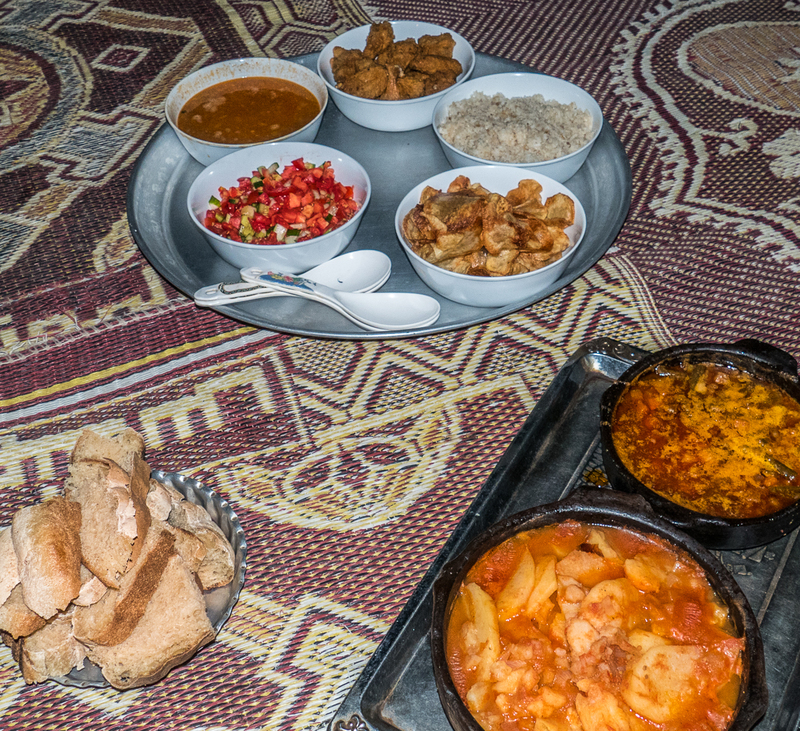 We are served one of the most delicious dinners we had in Egypt though I hardly remember what it was – bread and rice and tomato salad, and casseroles that were among the best I’ve ever eaten. 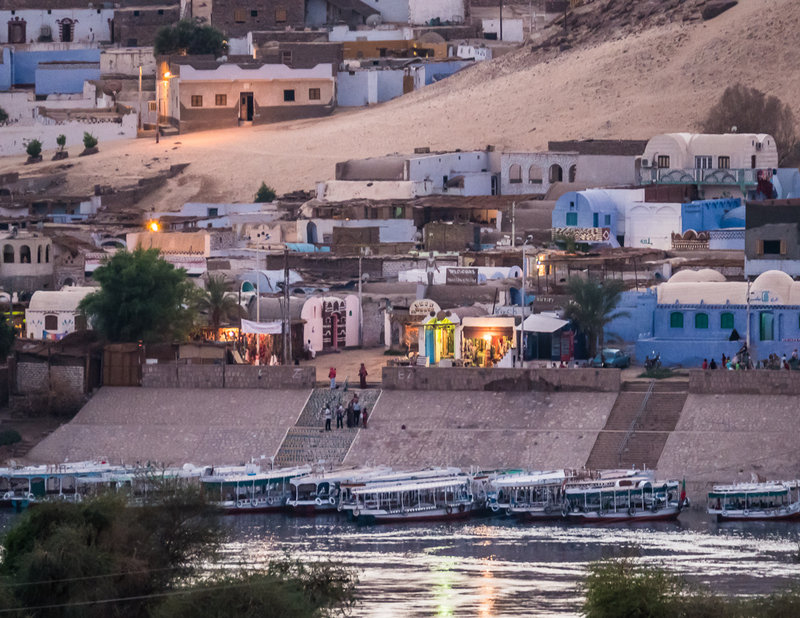 Deeply satisfied, quiet, and tired, in the silken darkness we drift back down the Nile to our cruise boat berthed at the dock in Aswan. Next post: The crown jewel of the UNESCO World Heritage “Nubian Monuments” site: the Abu Simbel Temples. And a brief lesson in how to make paper from papyrus. Thanks so much Mark. Egypt is an amazing place. I was constantly enraptured when I was there. What was the documentary? Pingback: Sacred River From the Stars: the Eternal Nile. — Adventures in Wonderland | What's Your Chic? What a lovely blend of prose with photography! Thanks so much Ann. I’m glad you enjoyed it. Thank you so much Annie. What a wonderful compliment. I guess the consistency part comes from my love for doing it, lots of practice, and even after five years of blogging a desire to be better at it. Some posts come easy, some are like pulling teeth, but I just keep at it because I love doing it, even when it’s hard. It takes a huge amount of time. Lovely photographs as usual! It’s only the first time I’m hearing about feluccas but they look so elegant and poised! 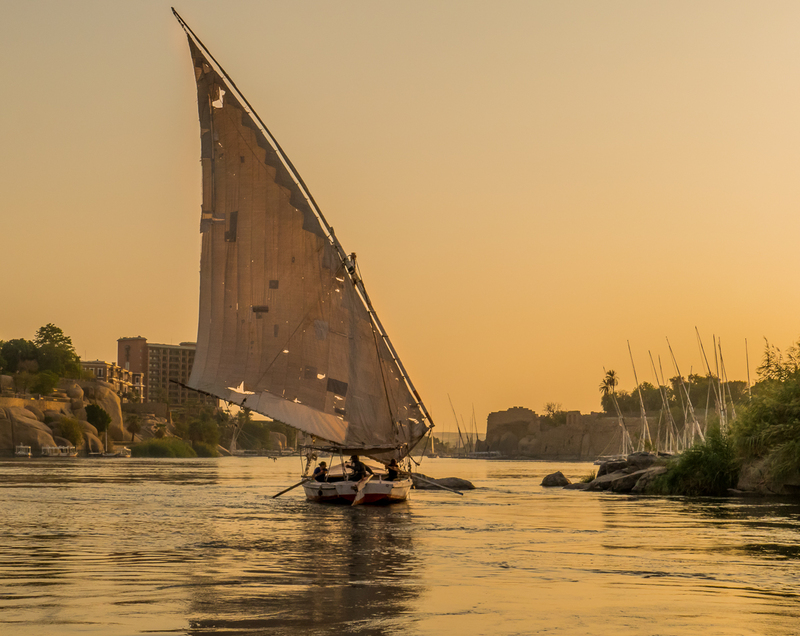 If surely love to sail up and down the Nile in these stunning boats…and to think these recite tales from a period so far back in history feels special!! Thanks Aishwarya. Aren’t feluccas wonderful! I fell in love with them the first time I ever heard of them, even before I saw one I think. It really is dreamy being on one, though anything overnight or longer is pretty rough travel. There are no toilets on board. Not even beds I don’t think. Pretty basic, but still a dreamy way to see the Nile. Thank you so much Anita. I love to hear that you feel as if you’re there – it’s what I aim for – to sink myself back into the time and the place and the feelings in hopes that others can see and feel it too. Egypt was really special for me. The smiling boys were a delightful surprise, and the kids on the ferry were having so much fun waving back and forth with us. We must seem exotic to them especially since there are so few tourists these days. That woman swimming in the Nile scared the heck out of us for a few minutes there. She would have drowned without the rope and the guys to pull her in, but she had both and got to fulfill her dream. And me too. 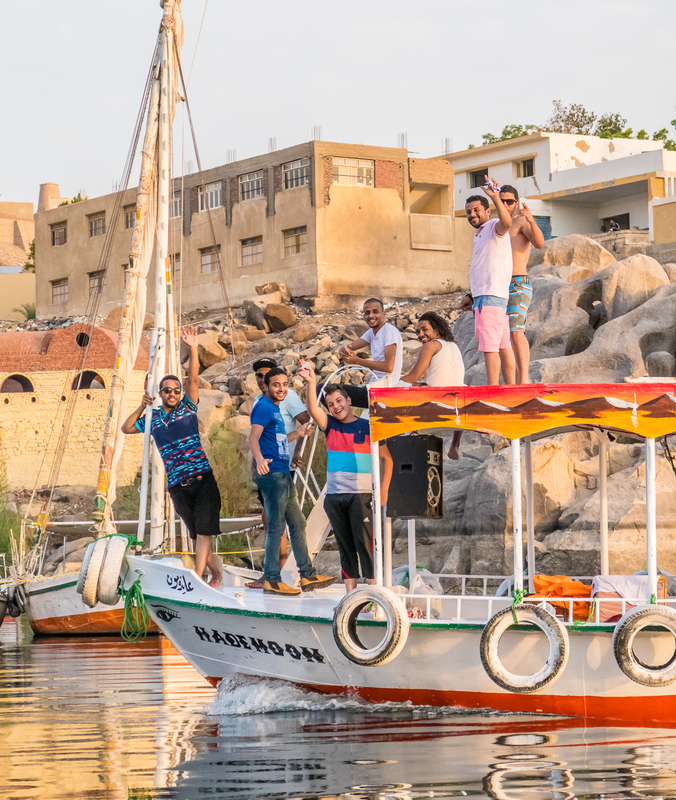 That felucca cruise was a joyful time. What beautiful photographs to compliment your prose. I was captivated by your story. It was as though I was there with you, sailing the Nile. Thanks so much macjam. I hope you enjoyed your trip on the Nile. It was lovely to have you along! Oh. My. Goodness. 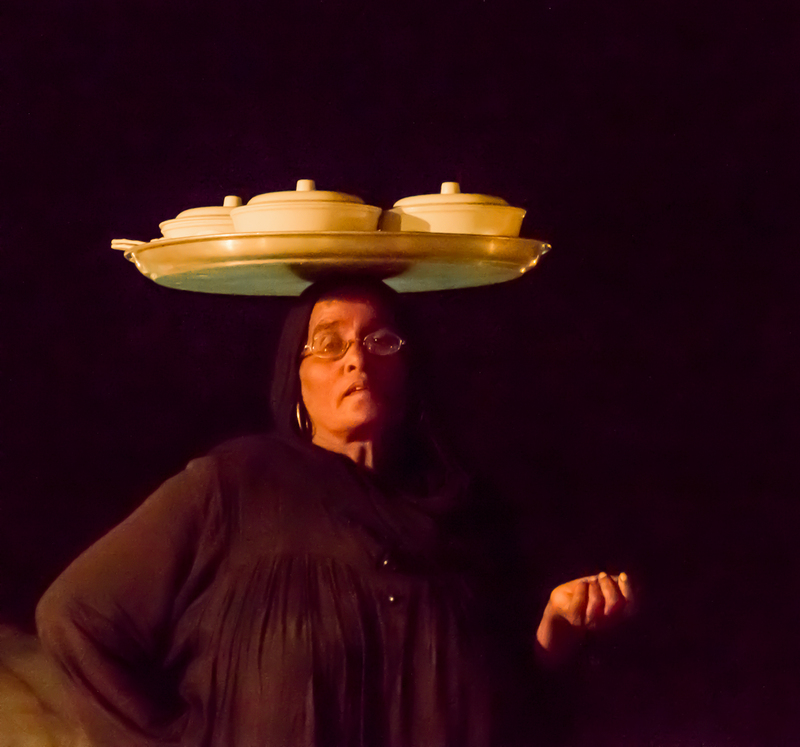 I am now used to your marvelous photographic skills, but those felucca shots took my breath away. Honestly, every photo in here gave me goosebumps. I find the word felucca and the idea of the Nile so impossibly romantic and exotic, and you got to do it! And I guess I did, too, through this brilliant post. That will have to tide me over until I can make this trip myself. Thank you so much! Okay, full disclosure – my sister who is a professional photographer helped me – a lot – with photo editing for this post. She is a Lightroom and Photoshop genius and I learned heaps! I too find feluccas and the idea of the Nile impossibly romantic, even after having been there. I can hardly believe I finally got to do it! 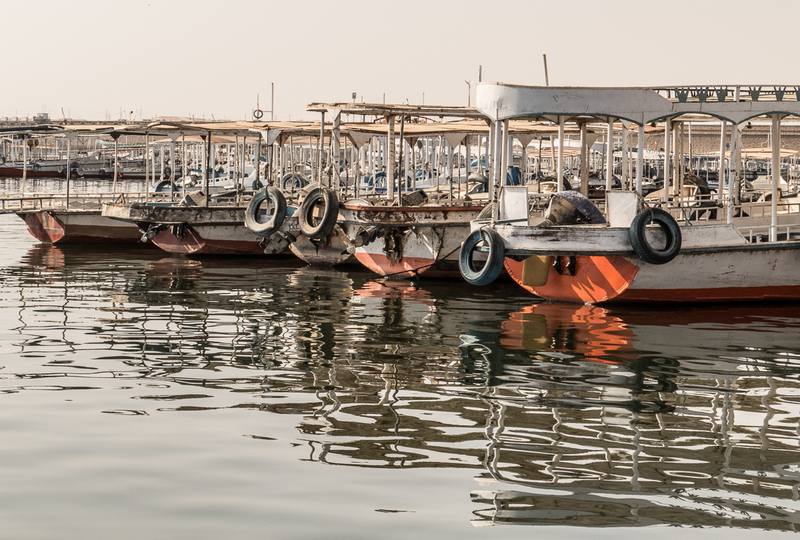 Get yourself to Egypt – it really is amazing as it seems. Wonderful captures of people. Your storytelling complements the pictures so well. Thanks so much Debbie. 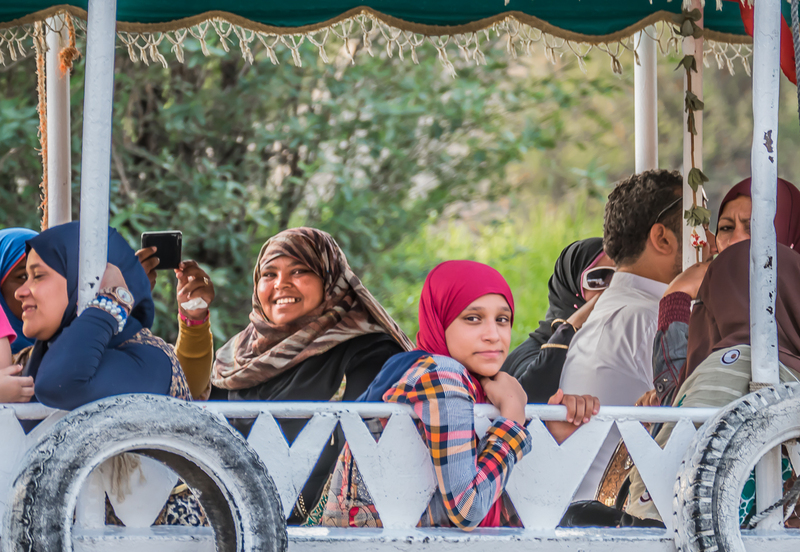 I’m finding it easy to tell stories about Egypt – it’s such an extraordinary place, and really special for me. What a great series of photos and what an amazing adventure! Thanks Naomi. Egypt was one of the highlights of all our travels for me. I’ve run out of superlatives, Alison! I love it that you take your readers on a personal journey with you. If I can’t travel as you and Don do, then this is the next best thing. Absolute bliss. Thank you so much. Oh thank you Ros! I’m so glad you’re enjoying the blog, and I love having you along for the journey. Thanks so much Gilda. Egypt is full of amazing stories. It’s one of the best places I’ve been to – so much fascinating history, and I’m so glad I finally got to go there. It was as good as I’d imagined for all those years. 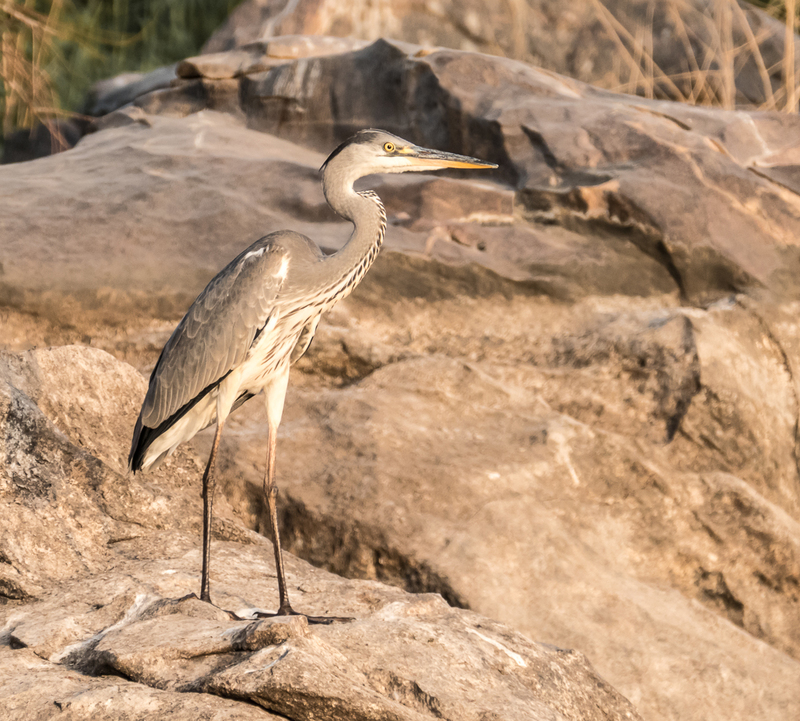 The Source of the River Nile is my hometown in Uganda, called Jinja. I learnt to swim at the very rapids where the Nile emerges from the waters of Lake Victoria. The rapids were very dangerous and when our parents would find out that we had been swimming there, we were literally scolded. Of course, their worry was not only the dangerous waters but the crocodiles and Hippos that frequented downriver. However, as you say, water has a magnetic attraction and that was reason enough to go to the River for the thrill. Besides, the only swimming pool in the town was strictly for the Colonial whites and brown skins were not allowed. In 1964, I was !8 and ready to pursue further education in Europe. It was then that I decided to fulfil my desire to know where this majestic River ended and what twists and turns were on its way. Thus was born the idea of following it from its source to both its ends…the White and the Blue Nile. So on foot and a backpack, off I went. the rest is history and when you talk about Abu Simbel, it is like yesterday. The German engineers were creating a marvel of rescuing the monuments from the high waters of Lake Nasser. What an unforgettable experience. Once lived, it becomes a drug for the sheer beauty and cultures that inhabit this earth. That was a journey through 21 countries for a teenager with acne. Thanks for your efforts to delight us all so very often. Your childhood sounds quite exciting Mashoud – rapids, crocs, rhinos! So did you travel following the White Nile to Khartoum and then up the Blue Nile? Did you travel from Khartoum to the Delta. What an amazing adventure it must have been, what a journey! How long did it take? I’ve been looking at a map trying to count all the countries you must have passed through. 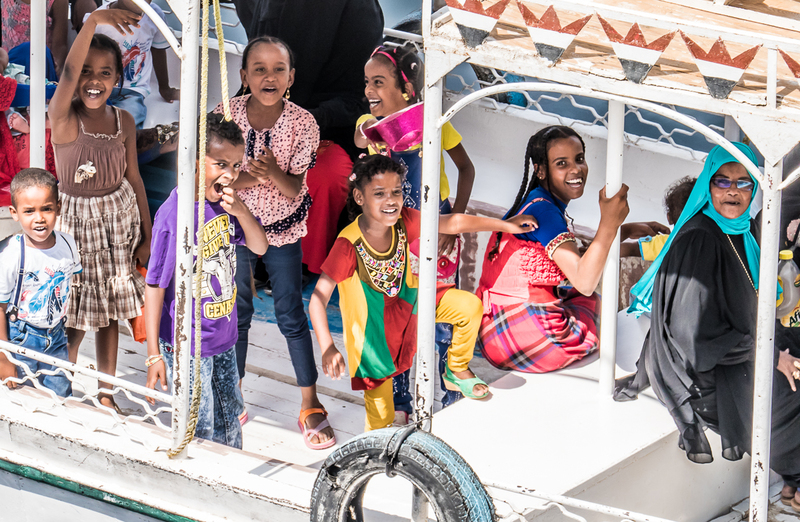 It took nearly four months and yes, North from Juba to Kosti to Khartoum to Shellal to Abu Simbel.. As you probably know, it would take forever to describe all the nuances of the route because there is a tremendous history to the Nile. Not only that, the deserts have their own peculiar civilizations and cultures. Few people realise that there are more pyramids in the Sudan than are in Egypt. The Blue Nile originating from Lake Tana is a journey I did afterwards also. In any case, it is the deserts that were most fascinating. 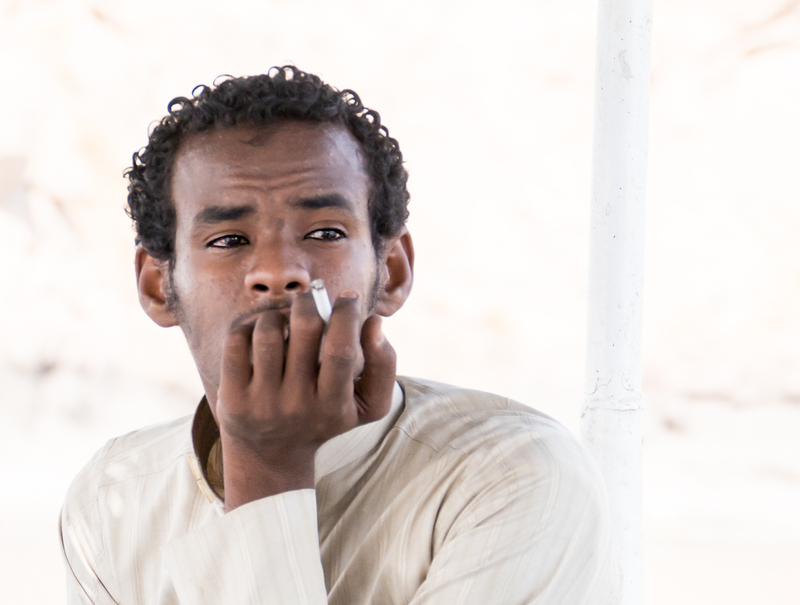 The Nubian desert is a miserable place that will leave you coated with white dust like cement. The Libyan desert has its own charm. But the desert that is to be experienced has to be the Sahara, especially around the Atlas mountains in Algeria and Morocco. So, I followed the path through North Africa..From Alexandria in Egypt to Libya, Tunisia, and so on crossing into Europe from Ceuta to Algecirus. Spain, Portugal, France, Switzerland, Austria, Leichtenstein,Germany, Luxembourg, Netherlands, Denmark and final destination, Lund, Sweden. Afterwards, the U.K. and Ireland. I have to say, that was a long time ago and blogging was not invented yet. Moreover, most of what I travelled, I have repeated numerous times since including many parts of Africa and S.E. Asia. The only difference being, I am able to afford a little more luxury and spend freely. I am not ashamed to admit, back in 1964, the entire journey cost me less than a 100 British pounds. I apologise for boring you with my recollections. Trust you will forgive your dedicated fan . Best wishes, Alison and may you always remain strong and motivated. It sounds like an amazing journey. I too travelled some of the same route some 35 years ago – Starting in Johannesburg, through SA to Botswana, Zimbabwe, Zambia, Tanzania and into Kenya. From Kenya into Sudan to Juba, then through CAR, Cameroon, Nigeria, Niger, Algeria, Morocco and then the same crossing as you from Ceuta to Algecirus and on to London. Yes, we to are able to afford a little more luxury these days. Best wishes to you too. Fabulous article as always, full of interesting facts and amazing images. You are wonderful storytellers. 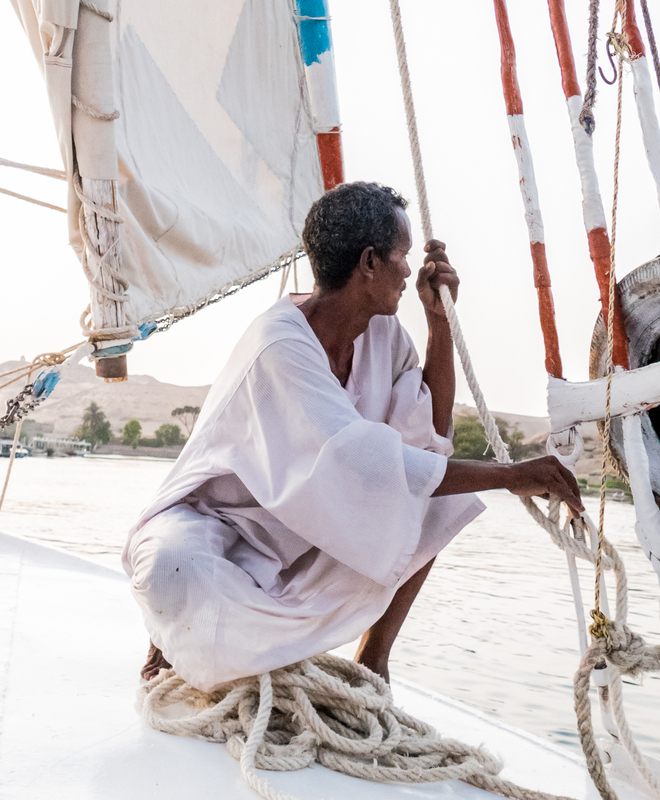 And a dream come true for you, sailing in a felucca on the Nile. It is a dream of mine too – one day, maybe. And that brave woman! It just goes to show that all things are possible if you believe they are. Blessings, Alison and Don. Safe journeying, till next time. Thanks Isaballarose. Egypt is really special, and I am truly grateful that I finally got to go there and live my dream.I hope you get there one day. Those photos! Amazing! Just when I thought the Nile photos were so great that it couldn’t get better, there were the incredible photos from that hotel. So dreamy. They remind me of my favorite novel, The Egyptian by Mika Waltari. And your excellent narration has made you one of my favorite bloggers – and I follow hundreds of blogs! (I only recently discovered you. I’m very happy I did!) Was all this on a tour, too, or was this an independent trip? Thanks so much TSMS. That hotel is fabulous. I’d love to be wealthy enough to stay there. Oh the luxury! We were on a tour. We usually travel independently but we decided for security reasons to do a tour in Egypt. It was for almost 2 weeks, and we saw a huge amount, without it feeling rushed. We had the best guide ever! Alison, your words are silken, just as the water you describe. I find great joy in coming to your blog. Another eloquently written post. Stunning photos! Thanks so much LuAnn for your wonderful compliments. I had a lot of fun putting this post together, especially because I had my sister help me with editing the photos. She is a Lightroom and Photoshop genius! Wow, Alison. I love your profound words about water. Such universal truth in your thoughts. I’m going to re-read that paragraph many times, I think. 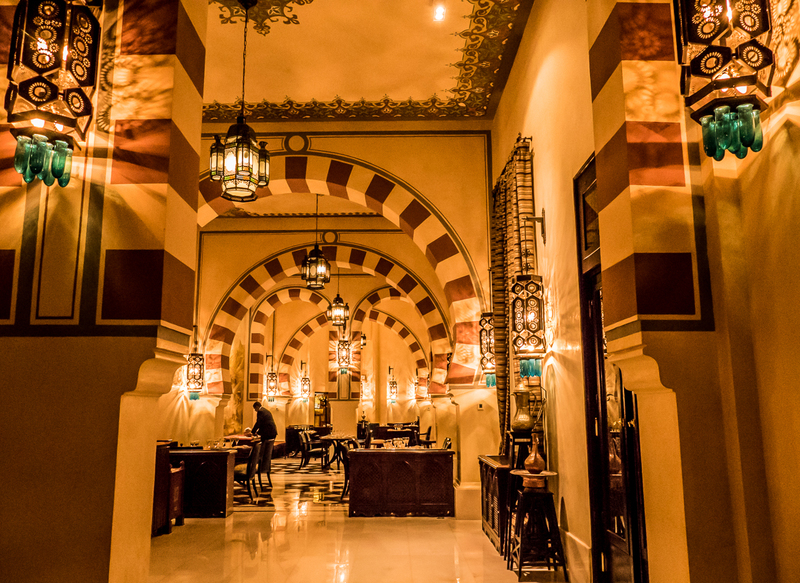 The Old Cataract Hotel looks divine! What a beautiful journey, and so many smiling people. 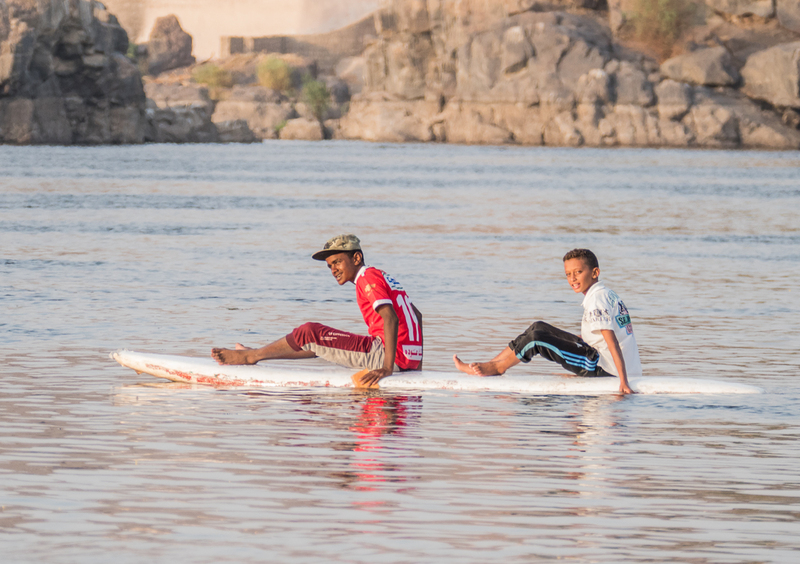 Wonderful to see the Nile from your perspective. Thanks Kelly. Re my words about water I was prompted by the photo beneath. It just came to me, but then I guess I view pretty much everything as symbolic. The Old Cataract *was* divine! I’d love to stay there – oh the luxury! In a less conventional way that whole time on the Nile was luxurious. In future posts I’ll write about the cruise and the places we stopped along the way. Just being on the water was a daily spellbinding luxury. I agree with Kelly. There’s something soothing about water, something that is essentially ourselves. I thoroughly enjoyed reading this post, Alison. Can’t wait for your next post on Abu Simbel! Thanks Bama. I always feel better when I’m around a body of water, especially calm water. I guess most of us do. Abu Simbel coming up. Beautiful post, once again. I, too, loved your profound words about water. Have you read Blue Mind by Wallace J. Nichols? I think you’d find it fascinating. And what a perspective on water!! Loved it.. Thanks Aruna. It was amazing being on the Nile. It’s such a huge river, it seems to get into your psyche. Thanks for this wonderful trip down memory lane. The photos are superb. I lived in Cairo, Egypt in the 1970s on Zamalek, an island in the Nile. And once, just once, the first time I lived there, I swam in the Nile. The saying goes, he who drinks of the Nile will return to drink again. In all, I’ve made five separate trips to Egypt, and twice I’ve transversed the north–south axis of the country by a combination of road, train and felucca. Thanks so much Peggy. That must have been amazing living in Egypt. And travelling up and down the country. I never did drink from the Nile so I guess I’m not going back though I’d like to. Thanks Curt. It was romantic. Iconic really. I’d love to do it again. Mastoid! Don’tcha just love autocorrect! I too was amazed by his story. We didn’t see any crocs but we did see croc mummies in the temple for the croc god. That’s to come in a figure post. with a fine soft wind. Living proof that dreams do come true! I am so glad you got to experience this and write about it for the rest of us. Me too! The whole of our time in Egypt felt like a dream come true. I’d wanted to go there for so long. It lives in my memory as a really special time. I just wanted to sail endlessly into the sunset with you on that felucca, Alison. 🙂 I haven’t had time to follow your Nile adventure but this is beyond beautiful. Thanks so much Jo. Egypt remains one of the highlights of all our travels. Thanks Hedy. 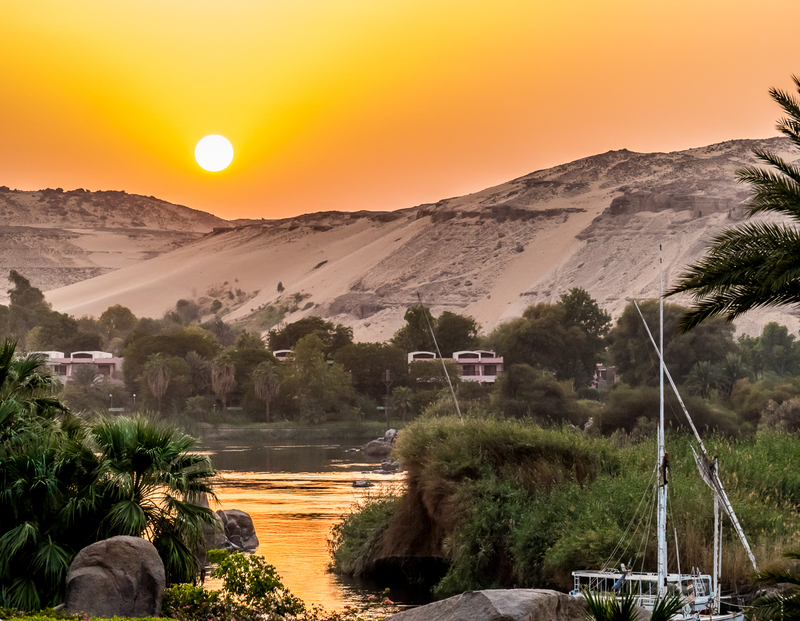 The light in Egypt was beautiful, especially on the river. I hope you get to Egypt one day. I don’t have enough superlatives for it – such a long and rich history. So many of my lifelong dreams were fulfilled there. My hands were sweating at the pulling in of the woman swimming. Captivating from the first sentence Alison! Wow I’m sure you won’t ever forget! 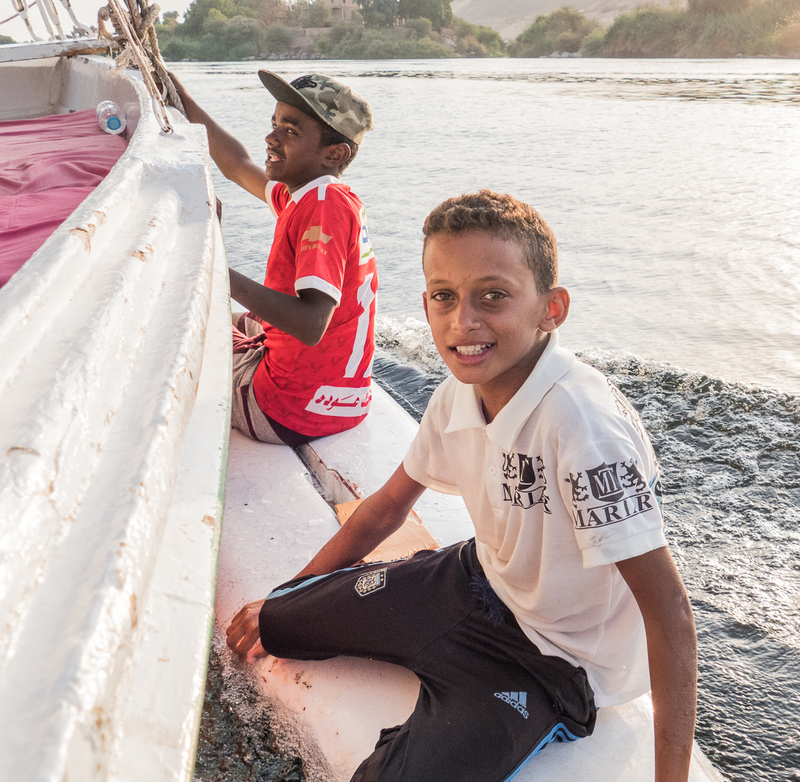 Your trip in the felucca seemed magical both in the telling and gorgeous photos. Thanks Sue. We were all sweating a little I think. I think it’s not an exaggeration to say that she would have drowned without the rope and the two guys there to haul her in. Even with that exciting interlude the felucca ride was indeed truly magical. I love what you wrote about water: “we will always, eventually, find our own level.” That’s how I feel at the ocean beach: as if all the extra stuff that doesn’t matter drains away and leaves me full of the things that are important. I am impressed that you condensed your post down from 2 days – there must’ve been a million great pictures of the water! 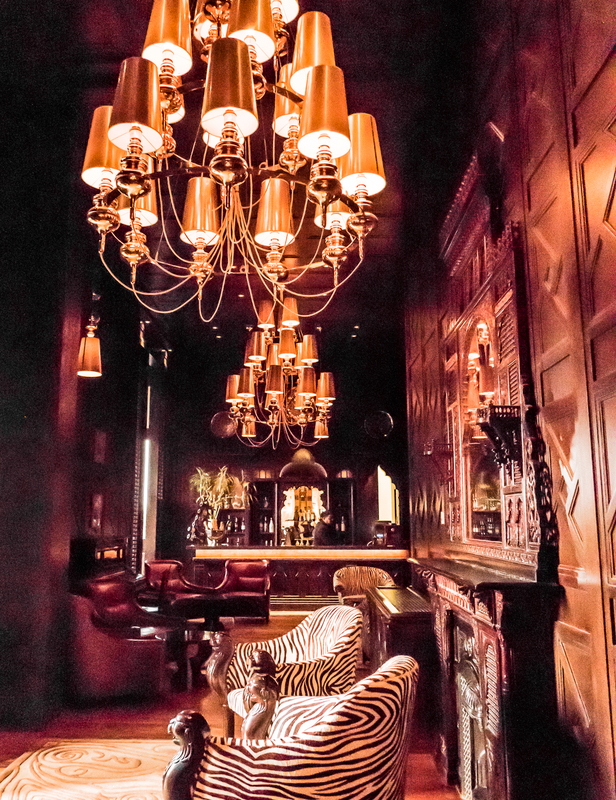 I also like the fancy hotel – I tried to imagine what it would be like to actually walk through the halls, rather than view a photograph, and could not. Did it feel surreal? Or did it feel normal (lavish, but normal) after several days in Egypt? Thanks Felicity. I feel the same way. I can sit and stare at the ocean for a long time, and always feel better afterwards. Every post is a challenge to sort out the best pics. I always have lots, and yes, ‘millions’ of the water. And more to come when I write about our 3 day cruise. The fancy hotel was like walking into another world – elegant and civilized and serene and *rich*, and yes, a little surreal. I’d like to get used to that world! A gin and tonic was $20. Not $20 Egyptian, $20 Canadian! There’s a grand old colonial hotel in Hanoi, the Metropole. We had dessert in one of the lounges one night. Both the Old Cataract and the Metropole are not remotely normal in their surroundings, but rather an aberration of the wealthy in far more prosaic environments. Your photos are ethereal Alison. They place me right where you are, and fill me with wonder. Your text is just the creme de la creme. How wonderful is it that I got to know you? Thanks so much Cindy! What wonderful compliments. I think it’s pretty wonderful that I got to know you! For this post I had my sister Suzanne help me with the photos. She is a Photoshop and Lightroom genius. It really helped. Thanks Michael. I love that the dream came true too! Many dreams came true in Egypt. I know what you mean about time. When the dream comes true time becomes a chimera, something that cannot be grasped in any way. It’s as if it was only yesterday that I had the dream of being on a felucca on the Nile, and here it is *apparently* forty years later that it happened. I’m sorry for what the dam has done. I’d love to have been there before it was built. What an incredible trip Alison. Wow. The photos are all so spectacular. Thanks Nicole. It’s definitely a wow kind of place. The whole trip in Egypt was incredible. I can’t say enough good stuff about it. Can’t wait to go there someday!